I’m very excited to announce a new project: Digital | Visual | Cultural. D|V|C is a series of events which will explore how the extensive use of digital visualising technologies creates new ways of seeing the world. The first event will be on June 28, when Shannon Mattern will give a public lecture in Oxford. Shannon is the author of the brilliant Code and Clay, Data and Dirt as well as lots of great essays for Places Journal. ‘Fifty Eyes on a Scene’ will replay a single urban scene from the perspective of several sets of machinic and creaturely eyes. That lecture will be free to attend but you’ll need to book. Booking opens via the D|V|C website on 23 April. It will also be livestreamed. I’m working on this with Sterling Mackinnon, and funding is coming from the School of Geography and the Environment, Oxford University, and St John’s College Oxford. The website has more info at dvcultural.org, and you can follow D|V|C on Twitter @dvcultural and on Instagram at dvcultural. There’ll be a couple more events in 2019 so follow us to stay in touch. I was very happy to receive a copy of a new edited collection last week: Geomedia Studies: Spaces and Mobilities in Mediatized Worlds, edited by Karin Fast, Andre Jansson, Johan Lindell, Linda Ryan Bengtsson and Mekonnen Tesfahuney. I have a chapter in it called “Look InsideTM: Corporate Visions of the Smart City”, which discusses the most popular corporate videos on YouTube (or at least, they were the most popular when I wrote the chapter eighteen months ago). These are videos that try to explain and/or sell the idea of the smart city or an urban Internet of Things. The chapter discusses what the videos show – all digital flow and glow, and (mostly men) explaining digital flow and glow – but also emphasises how easy it is to criticise that representational content. It then suggests that perhaps that’s not therefore where their power lies. Perhaps rather it’s their affective resonances that matter most: that flow, glow, speed, seamless mobility, in spaces where coloured light substitutes for data, everything is mutable and nothing ever seems to stop. There are lots of other great chapters in the book, and the editors make a strong case in their introduction for the importance of studying geomedia: “an expanding interdisciplinary research terrain at the intersections of media and geography” (p.4). Bring it on. 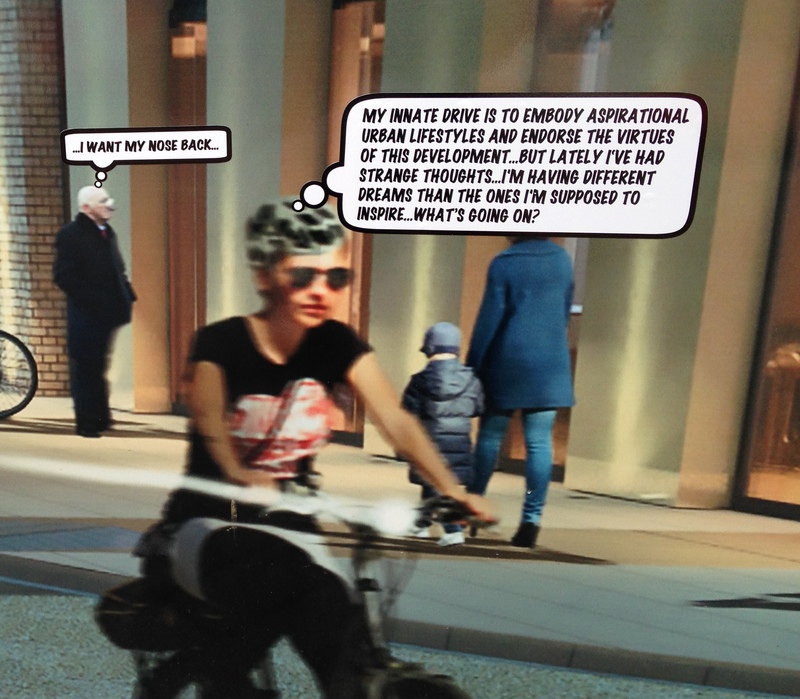 Milton Keynes, smart cities – and culture?! I’ve caught up with a fascinating video which made me pull these things together: it’s called Looking for Culture Through Economy, Through Capitalisation, Through Milton Keynes (LCTETCTMK for short. Well, kind of short). It’s directed by Sapphire Goss and was made as part of the Journal of Cultural Economy’s tenth birthday celebrations. A whole bunch of people were involved in its production, including Liz McFall, Darren Umney, Dave Moats and Fabian Muniesa. It starts tongue firmly in cheek, saying that it’s exploring the notion of ‘culture’ in a place often thought not to have any: Milton Keynes. The film then discusses what culture is, how to spot it, how it was planned and designed in MK, and its relation to capital. All of this is animated by the presence of someone who kind of becomes another team member: Stuart Hall. The cultural theorist appears in a range of archive footage, and one of the film’s many pleasures is to see him animated, poised and as relevant as ever. Another pleasure of the film is its rigour. This is a film about theory as much as it is about MK. Hence that clunky title. The arguments at the heart of the film are that culture remains a vitally important analytical category and that culture isn’t a thing. Culture can be The Arts, but the film is much more interested in culture as Hall understood it, as the ordinary, taken-for-granted meanings and values that animate everyday life. In that sense, culture is everywhere, mediating how we understand and what we see. The film enacts that everywhereness, filtering its views of the city through odd edits, collaging and splicing, using fuzzy archive film and repeating images. There aren’t that many clear views of the city, and the ones that are offered – the planners’ models, architects’ drawings, drone footage of layouts and geometric patterns below – tend to be shown as existing only in those forms. Once they become realised as part of the city, or the camera gets down to ground level, the clarity of their design and its intentions goes awry. They go fuzzy, multiple, the idealistic plans never quite work out, buildings fail and social markets are abandoned. It’s noted that capital should be seen culturally, as an approach to making value. And then there are a few closing remarks about how culture is now increasingly also capitalised as things are seen more and more in terms of the value they might realise in the future. All this is great on its own terms, and it’s wonderful to see the city provoking such careful and complicated thoughts. It also got me thinking about how another of the city’s current manifestations – MK as a smart city – also needs to be thought of in terms of this understanding of culture. ‘Culture’ and ‘smart’ are in one way quite often brought together now, in discussions about various discourses about what smart city should be; there are now several discussions of how talk about and pictures of smart cities are riven through and through with values, visions, interpretations, truth claims and situated evidencing. The smart city as something that can create capital by innovating new products and making efficiencies is a strong theme too. The more pervasive sense of culture, though, culture as everyday (rather than as something only marketeers and artists do) is less often explored. I was chairing a conference organised by Inside Government last week which was discussing how smart cities might transform service provision, and the day was full of the need to be brave, to take risks, to have vision, to make leaps of faith (as well as much more pragmatic discussions about mechanisms for collaboration between key stakeholders). (You can read my report on the day here.) Organisational culture, then, was actually at the centre of the discussion, that is, the everyday assumptions embedded into workplace practices. But LCTETCTMK also suggests a more deep-seated relation between smart and culture. The film ends with Stuart Hall suggesting that, after the 1970s, the sphere of culture is in “permanent revolution”. There are no set or stable frameworks of meaning now that can endure without challenge or renewal. Here then is a final thought provoked by LCTETCTMK: how are smart cities part of current cultural transformations? They’re about capitalisation for sure and about changing organisational culture. Perhaps their particular transformation, though, is more about the sort of everyday life that a smart city enacts. Mobile (so much of it is about movement), individualised (the phone screen, the data dot), agglomerated (databases), fast (nobody lingers in smart cities), colourful (all those glowing screens), customisable (what are your preferences? ), distributed (hello, platforms)… this is a more pervasive sense of cultural shift, enacted with and through smart things. Any other thoughts on what it would mean to think of smart MK, or indeed any smart city, through the lens of LCTETCTMK’s sense of culture? Do watch the film and ponder. And you can find more about MK, culture and smart on OpenLearn, here. I gave a keynote lecture at the Neue Kulturgeographie XIV conference a couple of weeks ago, at the University of Bayreuth. My topic was ‘seeing the city in digital times’. I talked about the challenges of keeping cultural geography relevant as a critical project when so much visual culture is now digital, and I shared my recent work looking at how so-called ‘smart cities’are pictured on YouTube and Twitter. You can hear my talk and see the presentation that accompanied it here. Listen through til the end if you can (or indeed just skip to about an hour in) because I got some great questions afterwards. It was a privilege to speak as such an energy-filled event – thankyou to my hosts Matt Hannah, Eberhard Rothfuss and Jan Hutta. I’ve just finished writing a chapter discussing the ways in which ‘smart cities’ are pictured in promotional videos. I’ve been working with twenty-one videos, all on YouTube, made by seven US and European companies: IBM, Microsoft, Intel, Cisco, Siemens, Thales and Vinci. The chapter is heading for a collection edited by Karin Fast called Geomedia, out next spring I think. It continues my efforts to think about how cities are being visually mediated in distinctively digital ways, and also in ways that are both representational and operative. In the meanwhile, I’d like to offer these ten top tips for the makers of these videos. make sure that your video starts with an aerial view – of the planet or of a city, it doesn’t matter, just make sure you start from on high and zoom in. ensure that every single image – apart from talking head interviews – moves. Film must picture things moving, animations must constantly transform, and if you’re stuck with having to film something that doesn’t move, overlay some animated graphics onto it. make sure you only film crowded public spaces, preferably with lots of kinds of transport. Then add some more transport. you must have at least one shot of traffic, at night, streaming through a glowing urban landscape. In fact, make as many things glow and flow as you can. don’t interview women, unless they are so important that it’s really unavoidable (which means a national CEO or the director of strategy of a national organisation at least). If you have to interview a woman, see if you can get away with not naming her. use as many kinds of imagery as you possibly can: photorealist aerial views, massing study fly-throughs, panoramas (pan across them), maps with things moving across them, powerpoint bullet points lists (again, these must be animated), app interfaces, systems diagrams, electric circuit notation, documentary video, etc etc etc. if you have to mention the health sector in relation to smart cities, or retail, make sure you picture only female nurses and shoppers. avoid any suggestion that there might be any discussion about the purposes, merits, functionality, reliability, unintended consequences or cost of smart tech. avoid any suggestion that a smart city has surburbs or houses. If you must show a house, make sure there’s a female figure in it either cooking or with a child. In fact, all children must be shown with female figures regardless of location. If you feel like adding a pushchair to your urban scene, make sure it’s being pushed by a female figure, and if the children are in school, ensure the teachers are female. finally, use music but use it carefully. It must either be uplifting and orchestral, of the we-are-moving-into-glorious-futures kind (though try to avoid it sounding too much like Lord of the Rings); or, preferably, it must be the plinky plonky cutesy sort of soundtrack popularised by Apple some time ago. Earlier this month, Clare Melhuish, Monica Degen and I published another paper from our ESRC-funded project ‘Architectural atmospheres’, which looked at how computer generated images intervene in the architectural design process. This paper focusses particularly on how such images might be the sites for the postcolonial visualisation of urban redevelopment projects. This paper explores how Computer Generated Images (CGIs) have enabled the visualisation and negotiation of a new urban imaginary in the production of a large-scale urban development project in Doha, Qatar. CGIs were central not only to the marketing but also the design of Msheireb Downtown. Our study of their production and circulation across a transnational architectural and construction team reveals how their digital characteristics allowed for the development of a negotiated, hybridised urban imaginary, within the context of a re-imaging and re-positioning of cities in a shifting global order. We suggest that CGIs enabled the co-production of a postcolonial urban aesthetic, disrupting the historical Orientalist gaze on the Gulf region, in three ways. Firstly, they circulate through a global network of actors negotiating diverse forms of knowledge from different contexts; secondly, they are composed from a mix of inter-referenced cultural sources and indicators visualising hybrid identities; and thirdly, they evoke a particular urban atmosphere which is both place- and culture-specific, and cosmopolitan. The study emphasises the importance of research into the technical and aesthetic production processes which generate new urban spaces in the context of global market-led growth; and, by considering the circulation of CGIs between sites, contributes to the development of “a more properly postcolonial studies” (Robinson 2011, 17). Earlier this year, I wrote a chapter for a book called Compact Cinematics – it’s edited by Pepita Hesselberth and Maria Poulaki and will be out from Bloomsbury early next year. The chapter is called ‘Screening smart cities: managing data, views and vertigo’. It’s a short chapter – Pepita and Maria hit upon the conceit of asking contributors to write compact pieces on examples of compact cinema, so we were given just 2,500 words – and it focuses on just one example of how smart cities are being visualised now: a promotional digital animation created by ISO Design for Siemens called Future Life. What I explore in that chapter is why the animation is a really interesting example of the spatial and visual relations through which the smart city is being imagined into existence. As well as on YouTube, you can view the animation on a panoramic screen in Siemens’s exhibition space in London, The Crystal. It purports to show London, New York and Copenhagen in 2050, and it’s really provocative for thinking about how future cities are being imagined now. And while in some ways the visuals are very familiar, with lots of pale white and grey buildings, lots of windows, thousands of trees and screens of all kinds, sunny skies and happy people, all managed from control centre using a holographic model of the city, there are also some rather more interesting aspects to this vision. In my chapter I focus on the visuality and spatiality of the animation. I think the visuality exemplifies what Thomas Elsaesser suggests are the ‘default values of digital visuality’: an immersive mobility in which the frame dissolves and the spectator is transported into the image. The spatiality is thus highly and smoothly mobile, as the animation’s point of view shifts and glides up and down and over and through. But there’s more to say about this animation, which in a longer chapter I would have explored. For example, throughout the animation its types of visual content smoothly morph from one to another, from landscape photograph (or at least a photo-realistic computer generated image) to a 3D massing model, to a luminous flow of data or energy in a black empty space, to an aerial photographic view. This visual profligacy – in which what were once very different kinds of images, wtih distinct materialisations, uses and ways of being seen are now available to a digital visualiser as a kind of drop-down visual menu, to be selected and used at will – also seems to me to be typical of digital visuals, though not many exemplify it to the extreme as this animation does. There’s also a lot of interesting things to think about in terms of the temporality of this vision. It’s a vision of the future seen through the current favoured aesthetic of architectural and real-time data visualisations; and a future which seems to have no past but also no sense of its own time passing, since nothing in its urban environments seems to have aged. And in terms of things ageing – that chapter has already aged in my eyes, after I talked about the animation in Amsterdam a couple of weeks ago, as a guest at the University of Amsterdam’s wonderful School for Cultural Analysis. It’s not the first time I’ve shown the animation to academics, and audiences always bring their own interpretations to the animation, of course. A favourite game that developed in several previous audiences has been ‘spot the visual reference’: audience members like to discuss what influenced the animation, and the list they’ve developed collectively is long, from Disney to Bauhaus, from Hollywood superhero movies to nineteenth-century panoramas, from computer games to maquettes – and as I’ve already suggested, that eclecticism is part of what makes the animation uniquely digital I think. It’s a high-end, smoothly edited, elegantly visioned, visual mash-up. In Amsterdam, though, I got rather different kind of questions – closer to what the animation might be doing with audiences less familiar with the relatively recent cultural history of a small part of the world, I think. My favourite came from Judith Naeff from Radboud University. I’d always thought of the floating point of view that’s performed by much of the animation, hovering in a slightly wobbly way, engine buzzing quietly in the background, over cities pictured in various ways, was the viewpoint from a helicopter. Judith, though, made a different and much better suggestion: that the animation inhabits the viewpoint of a drone camera. Absolutely. It’s a machinic vision, mediated not only by a camera (apparently) but also by a mobile machine: a hypermediated vision that’s increasingly shaping urban spaces. Elsaesser, T., 2013. The “return” of 3-D: on some of the logics and genealogies of the image in the twenty-first century. Critical Inquiry, 39(2), pp.217–246. MK:Smart is a large ‘smart city’ project based in Milton Keynes in the UK. It’s hosted by my home institution, The Open University. Its core work package when it was set up was the development of a open data hub: an repository of all sorts of big data about Milton Keynes, accessible to anyone. As the project has developed, though, its efforts to enable local people to engage with such an open data source have increased. One of these efforts is the website OurMK, and the project team also does lots of outreach in local schools. You can find about more about their work to facilitate ‘smart citizens’ here and some of their publications are listed here. As part of this engagement work, the MK:Smart team launched a photography competition in December 2015, with prizes for the best photographs picturing Milton Keynes as a smart city. You can see the finalists here. Car Park Drama by Suzanna Raymond. Suzanna’s caption read: The way the car park is integrated into the shopping centre looks like a smart design to me, making it an integral part of the layout rather then just a space added on as an afterthought. So one thing that struck me immediately about these nineteen was how so many of them focus on the landscape of Milton Keynes, and especially on its ‘natural’ landscape: trees, parks, canals, lakes, skies. There are no pictures of servers or data hubs or smartphones (though there are two photos of electric car charging points, one of a bus charging wirelessly and one of solar panels). 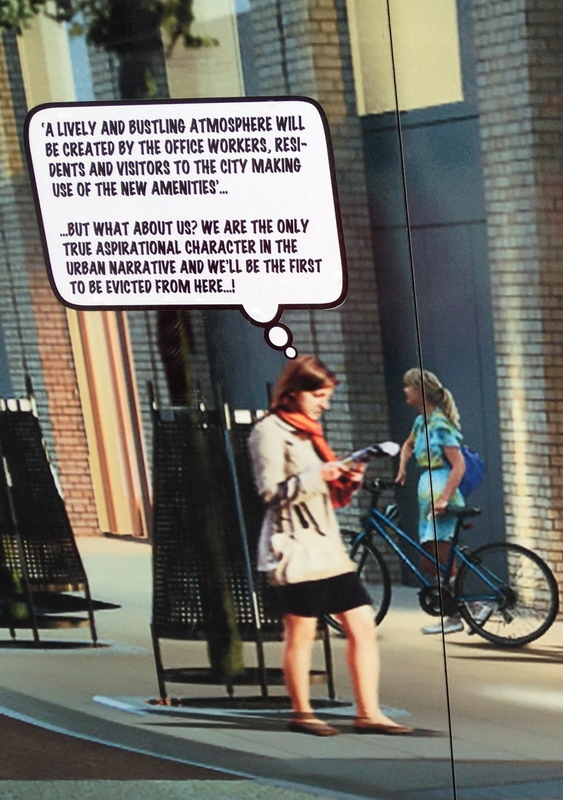 This preference for picturing a smart city as a green city perhaps speaks to the distinctive history of Milton Keynes. Milton Keynes was designed as a new city in the late 1960s and early 1970s with plenty of experiments in (and symbols of) more sustainable living: houses powered by solar energy, cycle ways paralleling the roads, a dial-a-bus service, a tree cathedral… the whole city is full of trees and parks and is oriented along a ley line! Milton Keynes has a strong sense of itself as green, then, and these photographs might be speaking to that sense of place. The photos perhaps also draw on a rather English preference for rural landscapes, gardens and parks. The other thing that struck me about the photographs was the way they display the sort of visual aesthetic that seems increasingly common in many digital images, which is a kind of glow against darkness, whether that’s lights gleaming at dusk or (elsewhere) live data feeds pulsating across a black background. No less than seven are taken around sunset, and one more makes a striking play between a sky darkened by clouds and a golden building. So, possibly, what we have in this admittedly tiny sample of photographs is an interesting play between what someone like Lev Manovich might suggest is an increasingly widespread visual aesthetic, driven by the extensive use of digital image creation/editing software – even a global visual aesthetic – and something that’s may be much more local, attuned to the specific histories of this particular city and its sense of place. Now, of course, as Doreen Massey would immediately have pointed out, there’s no clear distinction between the local and the global. Many of the ideas behind Milton Keynes, and implicit in its first visualisations, were imported by its architects from the west coast of the USA, for example, and I’ve already suggested that a love of rural landscape may be as much English as anything to do with Milton Keynes. But it’s precisely this play between the new and the old, between existing ways of seeing and of making images with new ways of seeing and making, that I find so fascinating in this small collection of photographs. I had a lot of fun a couple of weekends ago at the Big Bang Data exhibition. It claims to show “how the data explosion is transforming our world”, and if it doesn’t manage quite that, it’s certainly worth a visit. It’s on in London and its run has been extended to 20 March – not surprisingly, as it was packed out on the Saturday afternoon I visited. Its website has lots of materials on things that are in the show if you can’t make it to London. There’s lots to say about it. After a couple of artist installations to kick things off (Timo Arnall‘s Internet Machine and Ryoji Ikeda‘s gorgeous, entrancing Data.tron – and We Need Us by Julie Freeman is installed towards the show’s end), the exhibition was divided into zones that reflected pretty accurately a number of current academic ways of thinking about digital data: the materiality of ‘the cloud’; the ‘quantified self’; the massiveness of ‘big data’; ‘data for the common good’, looking at participatory uses of data and digital devices; ‘data is beautiful’. Each zone was full of examples of different kinds of engagements with digital data, by artists and designers and activists, and there were also a few (rather gestural) citations of earlier, pre-digital examples of images doing apparently similar things. There was also a massive ‘London Situation Room’, with a number of very large projections of various data streams from the city by Tekja, as well as two consoles with interactive screens of various kinds. 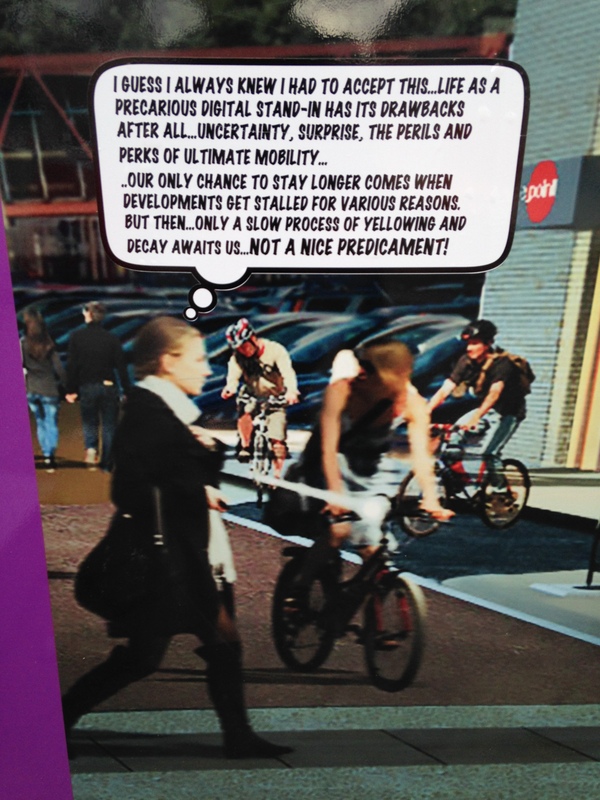 spotted at Cambridge station – cut-and-pasted people talk back! 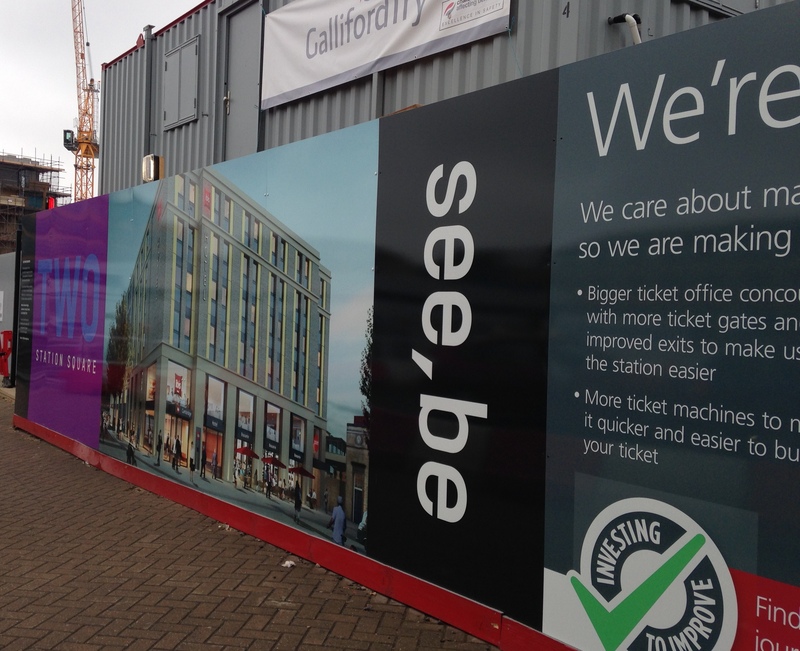 I always keep my eye out for building site billboards and their shiny (or not so shiny) digital visualisations to add to my collection, but at Cambridge station on Saturday I got a surprise. 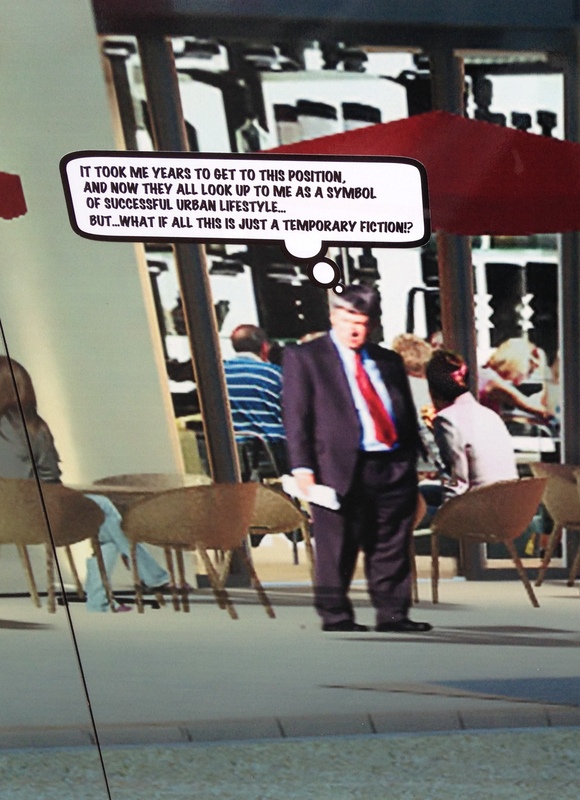 Someone has added speech bubbles to the figures cut-and-pasted into this hoarding. 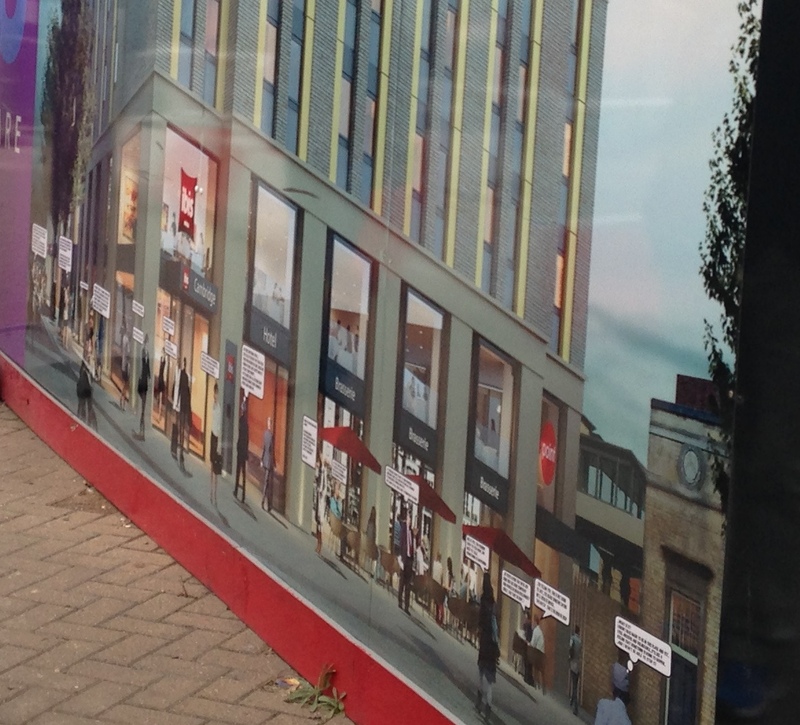 I took the photo above in June; below is the hoarding on 17 October. And here are some of bubbles in close-up. I have no idea who made this intervention, but my hat goes off to you. This blog is about how people make and encounter visual images, and what happens in those encounters (that's what I mean by visual culture). I'm interested in both everyday doings (things like family snaps, for example) and the more specialised ways in which more and more social scientists are using images as research tools (that's what I mean by visual research methods). I'm also particularly interested in how digital technologies are part of those encounters.